Imagine a stay in Rome that combines the best of country living and city amenities. 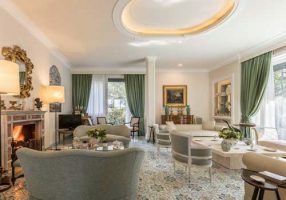 In a small, gated neighborhood near the prime Piazza del Popolo-Spanish Steps area, and accessed from Piazzale Flaminio, two villas perch just enough above the city such that you can toast the sun as it sets behind the dome of St Peter’s basilica in the distance. The neighborhood adjoins the Borghese Gardens. A 4-minute walk puts you at one of the popular cafés in Piazza del Popolo, the large pedestrian piazza that has welcomed visitors to the city for a millenium. In this tranquil area there are two villas available that can be rented individually or separately. They are on adjoining lots so are private but just a 1-minute walk between them. Villa Aurora, with 4 bedrooms, accommodating up to 9 guests, is a luxury fully serviced villa on three floors. Guests enjoy a dining terrace on the main level, a balcony on the second floor and a terrace on the third. It is surrounded by lawns and gardens. Comfortably furnished, the decorating is of very high quality. Kitchen and baths modern. Casa Ruffo offers 3 bedrooms for up to 6 guests on two levels. 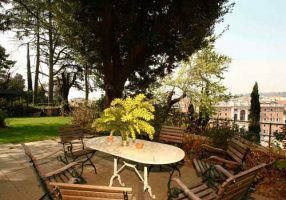 It is surrounded by gardens and has a ground level terrace overlooking Rome. For a larger group, the two properties together can accommodate 15 guests. Properties like this are incredibly rare in the center of this bustling city. Please s3nd me information about this 2 villas. The rates and availability.